Put your baby to sleep in minutes! New parents often find putting babies to sleep at night a herculean task. Babies have a different sleep wake cycle compared to adults as they prefer to stay awake at night. This causes problems for parents as they stay busy with their baby at night and suffer from lack of sleep. This app is specially designed for such parents who have tried everything to sooth their cranky babies and failed. 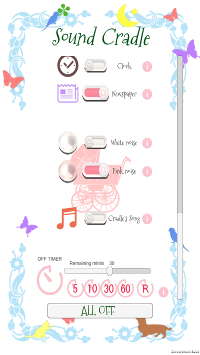 Sound Cradle has inbuilt sounds that distract your baby and keep him calm and sleepy. Babies have an acute sense of hearing and Sound Cradle utilises this by giving you a panel of common household noises to play that will intrigue your baby and keep him occupied. The sounds included in soundcradle mimic the sounds heard by the baby while in the womb. Most lf the sounds have been designed keeping the "whooshing" sound of blood flowing through veins and arteries tgat the baby hears during the pregnancy. 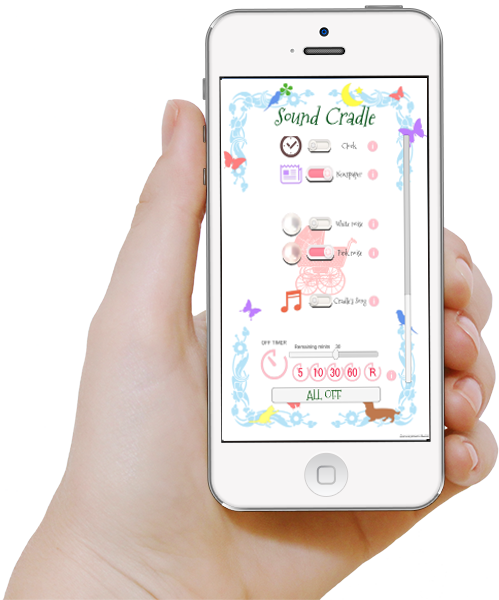 This app has been specially designed for mothers of newborns so they can have a peaceful night's sleep while their baby is placated by the sounds of the womb. 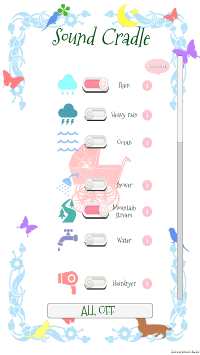 All this and more, neatly packed in a beautiful app- specially for new parents. Sooth your baby with these interesting sounds and put the baby to sleep in minutes. Download now and get a great night's rest with a calm, sleeping baby! It is similar to the womb sound. ・Sound Cradle, the Number One Baby Friend. ・10 tips to make your baby sleep soundly. ・5 things you should do, when your baby starts crying at midnight. ・5 Advantages of White Noise for Babies sleep. ・7 Reasons why Sleep is important for Babies. 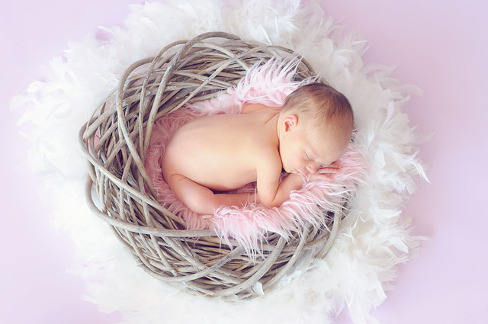 ・Do you know ideal sleeping environment of your baby? ・Benefits of Chamomile tea to babies. The baby was in the uterus for a long time. Baby is relieved because the sound of blood flowing through the blood vessels of the ear is similar to motor sounds and water sounds. 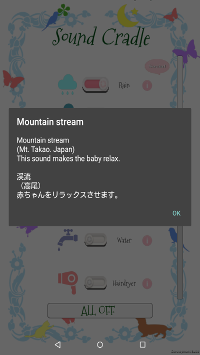 Since you can generate multiple sounds at the same time, you can make special recipes for your baby.